Pop idols Adam Lambert and Katy Perry turn heads outside Los Angeles’ Nokia Theater at the premiere of Michael Jackson’s ‘This Is It’ concert film on October 27. 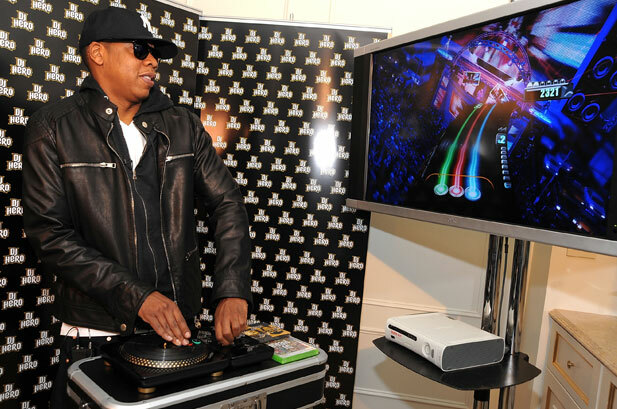 Jay-Z shows off his turntable skills at a press conference announcing the launch of DJ Hero in New York on October 26. Amy Winehouse made a glamorous return and grabbed all the attention at the Q Awards ceremony in London on Oct. 26. 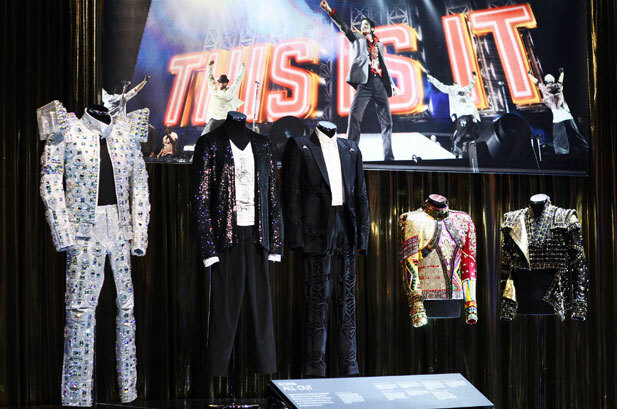 A selection of costumes intended to be worn by Michael Jackson during his ‘This Is It’ concerts went on display, with other memorabilia, at London’s 02 Arena on Oct. 26. Gwen Stefani performs with No Doubt at the 23rd Annual Bridge School Benefit in Mountainview, CA on Oct. 24. 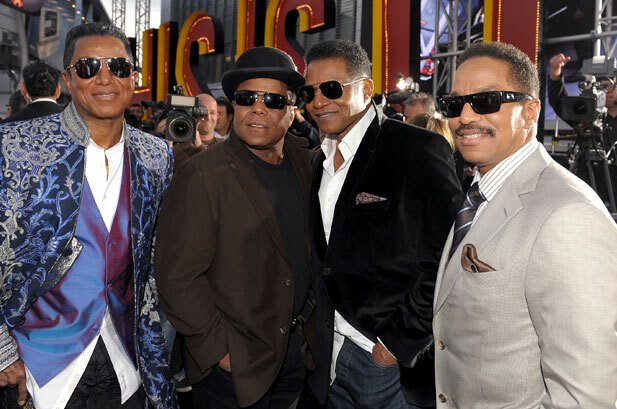 Jermaine, Tito, Jackie and Marlon Jackson arrive at the “This Is It” premiere in Los Angeles on Oct. 27. ‘Idol’ champ Kris Allen gets friendly with some of Miami’s finest at Land Shark Stadium, where he performed at a Dolphin’s tailgate party on Oct. 23. 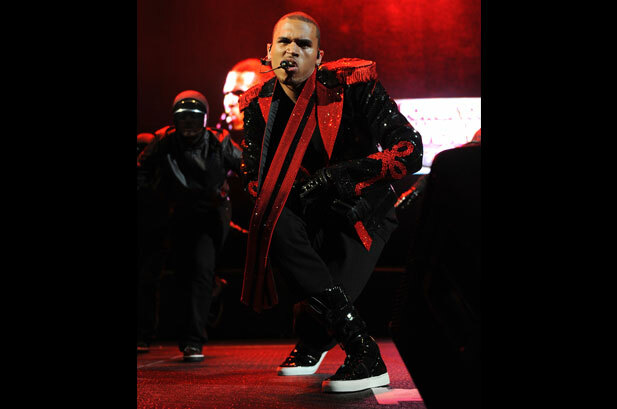 Chris Brown gets down and dirty during a performance at Power 105.1’s Powerhouse concert in East Rutherford, New Jersey on Oct. 27. 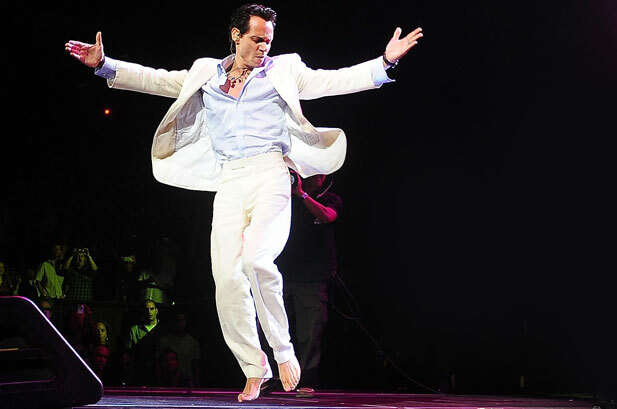 Latin heartthrob Marc Anthony feels the groove during his concert at Miami’s American Airlines Arena on October 24. 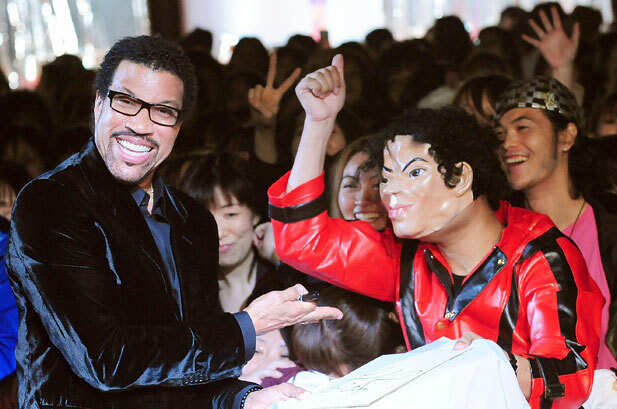 Lionel Richie greets enthusiastic fans outside of the Tokyo premiere of Michael Jackson’s ‘This Is It’ on October 28. Poison’s Bret Michaels attends the American Diabetes Association’s StepOut event at New York’s South Street Seaport on October 25. Country hunk Tim McGraw howls for the crowd in New York’s Rockefeller Center during a performance for NBC’s ‘Today’ show on Oct. 23. 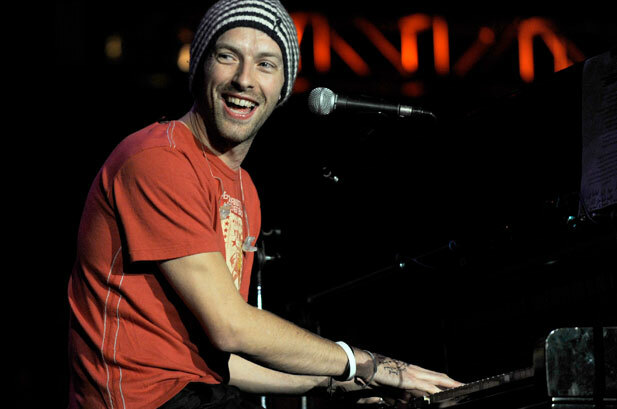 Coldplay’s Chris Martin performs a rare solo set at the 23rd Annual Bridge School Benefit in Mountainview, CA on Oct. 24. 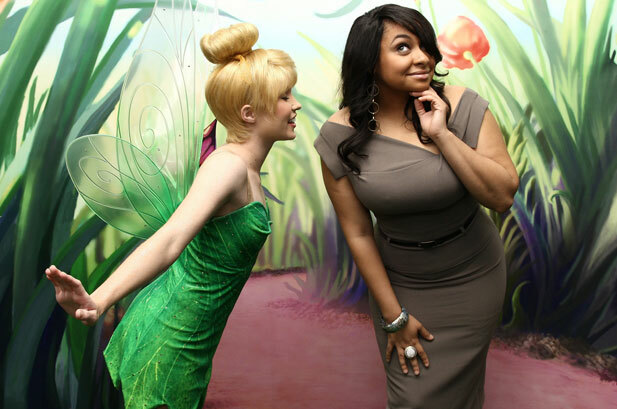 Tinkerbell shares secrets with Raven-Symoné at a ceremony naming the little green fairy as ‘Honorary Ambassador of Green’ by the United Nations on Oct. 25. 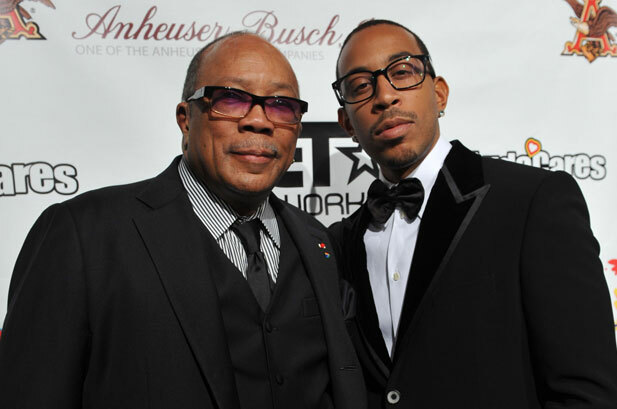 Quincy Jones and Ludacris looked sharp as tacks on the red carpet for the Ludacris Foundation’s 6th Annual Benefit Dinner on Oct. 24. Prince protégé Shelia E. arrives at camp Ronald McDonald for the 17th annual Halloween Carnival at L.A.’s Universal Studios on Oct. 25. 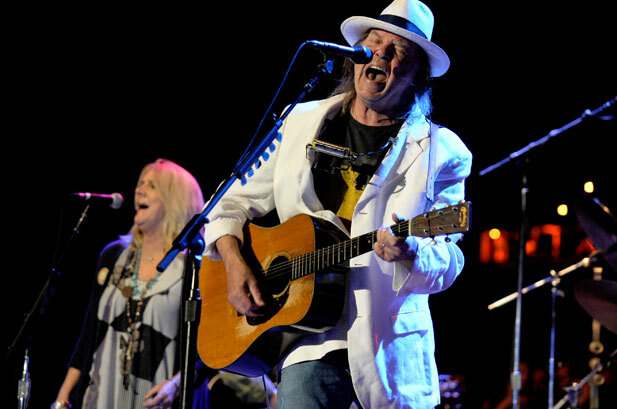 Bridge School Benefit organizer Neil Young performs the 23rd annual charity concert in Mountain View, California on October 24. 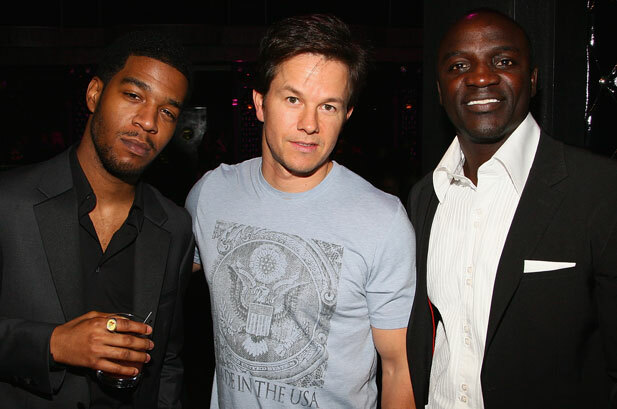 Kid Cudi, actor Mark Wahlberg and Akon share style tips at the 2009 GQ Gentlemen’s Ball 2009 at the Edison Ballroom in New York City on Oct. 28. Emma “Baby” Bunton congratulates fellow Spice Girl Melanie “Sporty” Chisholm as she celebrates her first night as part of the ‘Blood Brothers’ play cast in London on Oct. 26. 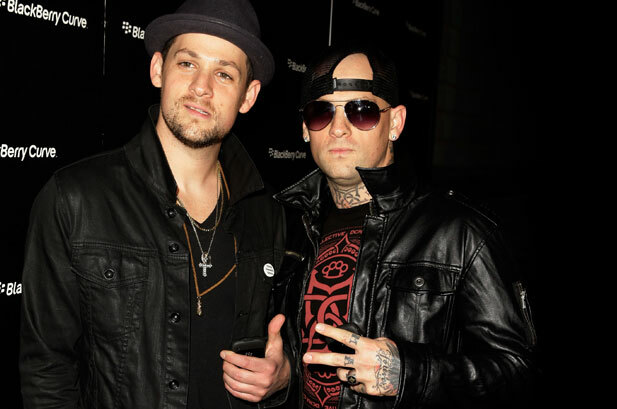 Joel and Benji Madden of Good Charlotte were back in black at the ‘Blackberry Curve’ launch party in Sydney, Australia on October 27. 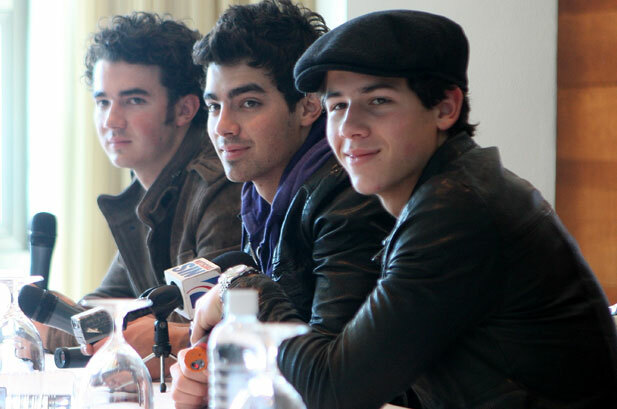 Kevin, Joe and Nick Jonas hold a press conference in the Dominican Republic during a stop on the Jonas Bros.’ world tour on October 25. Billboard fan Daniel Erhart shot this photo of Carrie Underwood performing at the Mohegan Sun Arena in Uncasville, CT on Jan. 31, 2008. Next week’s fan photo could be yours!